Set behind the house boat-lined canals of Copenhagen’s Christianshavn neighbourhood, Tina Seidenfaden Busck’s hybrid gallery, The Apartment, has garnered global recognition and a cult following since its inception in 2011. Now, the space revered for curating iconic midcentury gems that people covet for their homes, brings you one step closer by launching its own accommodation concept. 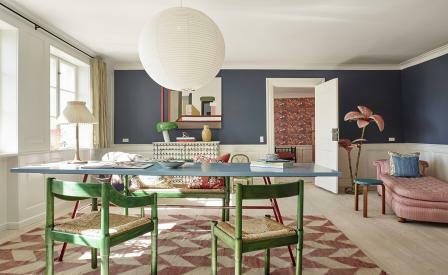 Well known for its effortless curation of eccentric design, The Apartment’s interiors are noted for including historic Scandinavian icons such as Estrid Ericson and Josef Frank’s Svenskst Tenn pieces, while the walls host works from Busck’s private collection, including art by Tómas Saraceno and Nathalie du Pasquier. Inside the restored 18th-century building, two unique bedrooms come together in the sun-soaked central living room, while those looking for an escape can browse the handpicked book collection in the drawing room, or take in the bathroom’s Swedish marble while relaxing in the tub.